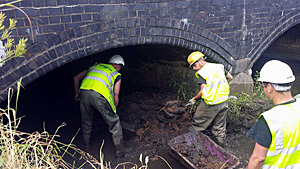 Local authorities and infrastructure providers are usually required to keep the rivers and streams under road and rail bridges free from deposits of silt and other obstructions that may cause a river or stream to flood therefore threatening structural damage to buildings and causing damage and loss of crops on agricultural land. Since the floods of 2013-14 it has been a matter of urgency to keep these water ways free flowing. Since this time our staff have gained extensive experience of this type of work and have an outstanding track record of bridge works and are regularly employed by county councils for these essential works. We use the best available equipment and with our expertise in deploying Aquadam©, have a competitive advantage on the very few companies willing to undertake such works. Whilst some bridges are a large span and have sufficient space to walk under, many are less than 1 square metre and have very limited access. In addition, bridges are often in box culverts or have critical utility networks (gas, electric and water) running underneath. In many cases mechanical clearance is not possible and in such circumstances all work must be completed manually. 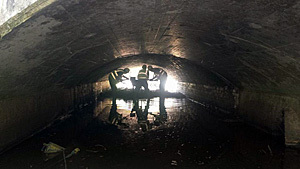 If you require proposals and a quote for carrying out major de-silting under a bridge, please contact us and we will be happy to visit the site and assess the situation.